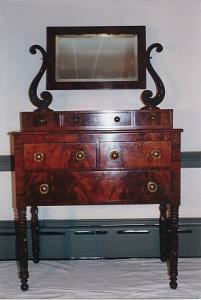 This Fabulous Classical Empire mahogany Dresser is a tipycal exemple of the American Federal/Neoclassical period. It retains its original mirror,hardware, finish and it is also Signed and Dated. All four legs are artisticly carved by a Master Carver. Condition: Excellent. Dimensions are: H= 65 W= 39 D= 21 inches. America, 1821.